The 1960’s were definitely a time of social disruption and transformation as a new generation searched for personal meaning and a more just social order. In the domain of cannabis awareness, advocates championed the plant’s psychoactive effects as a path to spiritual enlightenment and social tolerance while detractors portrayed it as a dangerous substance. In retrospect, there were many cases where cannabis was misused and abused, but nestled among these conflicting viewpoints was traditional herbal wisdom from many cultures relating to the plant’s potential therapeutic value. Fifty years later, cannabis appears poised to be accepted into mainstream society at the same time that a willingness to question the mainstream status quo, particularly that of institutional/corporate media and marketing propaganda, has risen dramatically. A key practitioner and beneficiary of marketing propaganda during this time has been the pharmaceutical industry. No other industry delivers their agenda more relentlessly, pervasively, and effectively. It’s therefore ironic that in the area of cannabis product manufacturing, it has been pharmaceutical technology (supercritical CO2 extraction) that has been adopted as the industrial standard for processing the hemp plant. At HeavenSentHemp we deeply respect time-honored herbal preparation methods that employ simple and appropriate technologies to achieve safe herbal products with superb bioactivity. On a molecular basis and from the standpoint of quantum biology, bio-energetic resonance and bio-coherence powerfully influence cell signaling. Cell signaling establishes the basis for body balance. Hemp, above all herbs, may well be the emperor of cell signaling, and the subtle factors that influence that must not be overlooked. We have produced trial hemp supplements by different means to compare them to pharmaceutical hemp extraction technologies (such as very common supercritical CO2 extraction). When our “old world” hand extracted hemp extracts have been evaluated by experienced holistic health professionals (comparing them to CO2 extracted hemp brand leaders), they often report that our extracts produce results not achieved by other products. Following lock step with precedents firmly established by the pharmaceutical industry, the focus of hemp’s healing is being spotlighted on late stage illnesses such as cancer and serious seizure disorders. Why is there virtually no discussion of countless possibilities for the use of hemp for prevention of illness, or for slowing the progression of numerous environmentally caused illnesses? There is likely a simple and disturbing answer. If real preventive health care were genuinely being practiced, Big Pharma profits (that depend on long-term use of symptomatic prescription drugs) would plummet. Their current business model would eventually be destroyed. There is a way for the average citizen to help create a bright and encouraging future for our health. First adopt essential practices of optimal diet, exercise, and elevated mental and spiritual health. Then, should it be necessary, become personally familiar with skilled health care providers (that practice hands-on natural therapies) so they may direct the selection of outstanding natural products to help you avoid “diseases of civilization”. Such individuals can be found among the ranks of chiropractic, naturopathic, and osteopathic physicians; medical physicians that embrace functional and biological medicine; TCM (traditional Chinese medicine) practitioners-e.g. acupuncturists; holistic nutritionists; and an interesting group of non-licensed individuals that simply have a talent for healing, and have invested the necessary effort to learn to tackle health challenges by natural means. It is the above group as a whole (that could be called “Rational Holistic Medical Empiricists”) that is the constituency upon which HeavenSentHempTM relies to test and evaluate its leading edge hemp products. Over time, in the right hands, theories on possible novel applications of hemp can be empirically proven or discarded rather quickly . Our pledge to HeavenSentHempTM customers is that we will strive to consistently improve in our products the “hidden intangibles” of superb bio-harmonics that is essential for optimal health benefits while at the same time adhering to valid science that measures and reports the chemical content of our extracts. Menendez, Javier A. et al. Extra virgin olive oil polyphenols inhibit HER2-induced malignant transformation in human breast epithelial cells. International Journal of Oncology 2009, 34: 43-51. In about 1 of every 5 breast cancers, the cancer cells have a gene mutation that makes an excess of a protein called human epidermal growth factor receptor 2 (HER2) that promotes the growth of cancer cells. Dr. Javier Menendez and other investigators have firmly established in numerous publications that polyphenols in EVOO inhibit malignant cell transformation in experimental breast cancer cell lines by down regulating production of HER2. One cannot help but speculate that the combination of olive oil’s polyphenols with the terpenes, polyphenols, and cannabinoids of industrial hemp are a “marriage made in heaven”. 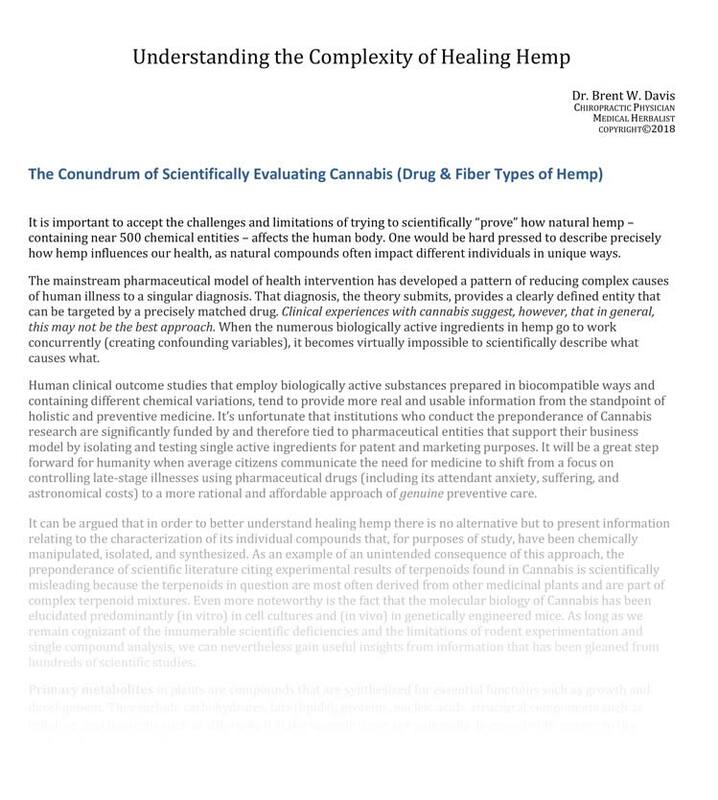 In this 61 page ground breaking whitepaper, Dr. Brent Davis utilizes his 40 years as a holistic medical clinician and master herbalist to synthesize the broad and often-confusing array of information sources that currently exist within the hemp/cannabis domain.